Please refer to our stock # 1822 when inquiring. 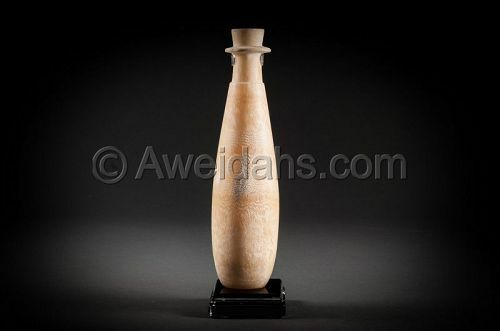 LARGE Ancient Egyptian elegant cosmetic vessel, in slender form with a collared rim, tapering to a narrow base. Artfully exploiting the banding in the stone, excellent surface preservation. Condition: Minor chip at the rim around neck as shown otherwise intact, untouched as found! Ancient Egyptian alabaster is a type of white translucent stone used in statuary, architecture, altars and vessels. It is a form of limestone more accurately described as travertine. It occurs principally in the area of Middle Egypt, the main Pharaonic source being Hatnub about ten miles southeast of the New Kingdom city at El-Amarina. These vessels contained oils and other unguents that had been perfumed with various aromatic herbs and spices, for use on the living body or as sacred oils to anoint the mummy in the tomb at various stages of the ritual ‘opening of the mouth’ ceremony. From the early Dynastic period onwards alabaster was increasingly used for the production of cosmetic and funerary vessels and the skilled craftsmen chose and shaped the stone to maximise the decorative effect of the natural colour and banding.